We go to the movies to be entertained and not necessarily for history lessons. That hasn't stopped writers and filmmakers from making countless films that chronicle historical events since the beginning of the mediums inception. Even D.W. Griffith's The Birth of a Nation which is credited as one of the first motion pictures and innovating several techniques that shaped modern filmmaking is a story revolving around the Civil War and reconstruction-era America. The majority of the time though there seems reason to bring these stories and settings to the big screen by way of there being an inspirational, harrowing, unbelievable, or simply engaging story that deserves to be told and expressed to the largest audience possible. That something engaging about the story would likely be the key element were you to talk to any writer or filmmaker and it is easy to see how writer Josh Singer who has written for several credible TV shows such as The West Wing and Law & Order, and Lie to Me and director Bill Condon (Dreamgirls, Kinsey and yes, the last two Twilight films) saw the inherent drama and, to use that word again, engaging elements of the story of Julian Assange, the Australian activist who began the website WikiLeaks which publishes secret information that has been submitted to his website as he claims to protect his sources who would otherwise be too afraid to come forward with said information. There is naturally a human element to this story as Assange is an intriguing public figure that has received plenty of press coverage over the past few years as his name and image might very well be more popular or recognizable than the reasons why this is so, but there is also a cultural aspect of Assange's story that addresses the changing of the tide on how the world receives information and this aspect, while I didn't see it coming as a part of the narrative, has a very interesting idea to it that could have been taken advantage of and conveyed in a much more interesting way while the human element is simply left to the performers trying to make the drama function while having nothing solid to work with. They are left to trying to make staring intently at a monitor and typing ferociously as intense as possible rather than backing up and dealing with the actual emotions that come with the weight of what they're typing on their laptops. It isn't so much engaging as it is facts being stated with nothing for us to be moved, shocked, or entertained by. Daniel Domscheit-Berg (Daniel Brühl) and Julian Assange (Benedict Cumberbatch) in The Fifth Estate. Based on a number of books written by both Daniel Domscheit-Berg who is portrayed by Daniel Brühl (Rush, Inglorious Basterds) in the film and two writers from The Guardian, David Leigh and Mike Harding, who worked closely with Assange The Fifth Estate tries desperately to tell the story of one mans rise to power through his willingness to sacrifice whoever and whatever it took to make a difference. It is a difficult line to walk and the movie shows us that. You can't have it all without hurting people in the process, this is inevitable, but when your mission is to try and stop people from being hurt and in fact save them from the secrets that have been kept from the majority of the world you must be even more delicate about how you plan to achieve your goal and though Assange's plight can certainly be looked at as being quite admirable it is ultimately the way in which he went about conducting himself using a system of absolutes rather than a case by case evaluation that began to turn him from an activist to public enemy number one. The film begins by placing us right in the middle of the heated publishing of over 90,000 Afghanistan war documents in 2010 that painted a rather disturbing picture of America's longest military engagement. There is clearly tension between Assange and Berg who by this point had become Assange's partner in pushing WikiLeaks to its full potential. There are lies being told, rules being broken, but Assange doesn't care because he is accomplishing what he always set out to do and that he is garnering a lot of attention (both positive and negative) for what he's done the film paints it in a light that hopes to make us believe that while his facade was to act on behalf of the betterment of humanity his true purpose was to put himself in a position of power. 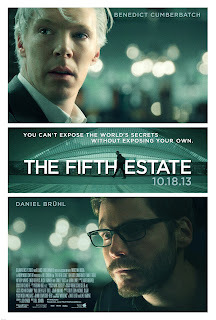 It is hard to decide what side of the fence this fictional version of Assange falls on (I don't know enough about the actual Julian to have a credible opinion) because Benedict Cumberbatch plays him with such a dignified sense of self that we truly believe he is searching for nothing more than truth, justice and the American way if not because he finds hope in truly believing in something, but for the fact he has a passion for this particular subject and it brings him a purpose in his life that nothing else has been able to fill. Let us discuss the Cumberbatch though, because he has amassed a large following and by now most of you might be aware this film had the worst debut in terms of box office in all of 2013. This may or may not have something to do with the quality of the film, that is debatable as is how much of a factor was the press, the tepid reviews and the fact the real Assange publicly bashing it. Of course, it could all be bad timing as the adult drama quota is filled to the brim right now with both Gravity and Captain Phillips knocking all kinds of expectations out of the park. Getting back to the Batch though, he certainly gets the mannerisms and vocal tone down, but the most intriguing thing about Assange is his drive and this is where Cumberbatch is able to do his most impressive work, but in a film that undermines his performance and throws in a grab bag of visual gimmicks that attempt to supply a real-world environment to the world of computers, servers and message boards it simply comes off as little more than cheesy. This is really a shame because both Cumberbatch and Brühl are more than capable actors that don't need tons of fireworks going off to make their characters compelling. They are able to reach the audience and connect with them based more on their presence than anything else and it's as if Condon is doing everything in his power to overshadow what is arguably his films strongest aspect. The script condenses so much into so little time trying to kick it off with what his characters are most notable for and then looping back four years or so to the beginnings of Berg and Assange's friendship to bring us up to speed on the war documents case. In doing this it sacrifices a solid sense of character development though and allows people to come in and out with varying degrees of importance without the audience ever really being aware of who they are or what their function is. This is all slightly depressing because there is clear potential here, but instead of feeling as if we are spectators let into this unknown world we feel as if we are rushing through cliff notes that aren't even able to hold our attention because there is no weight, no feeling, no genuine human emotion attached to them despite the fact the mission of our main character is to bring compassion and knowledge to the world. Assange, Birgitta Jónsdóttir (Carice van Houten), Berg, and Marcus (Moritz Bleibtreu) watch leaked war video. Where The Fifth Estate becomes more than something of a stylistic overcompensation and emotional dud is when we are introduced to the likes of Laura Linney, Stanley Tucci and Anthony Mackie as government officials attempting to contain the damages done by Assange and his crew once the "Collateral Murder" video and Afghanistan documents are released. There are moments within these sections that carry real tension, actual anticipation and they couldn't feel more removed from the rest of the film. I'd almost forgot these high profile names were even in the film until they showed up about an hour into the proceedings, but thankfully they are referred to occasionally from that point on not only illustrating the opposing perspective to Assange, but garnering actual cinematic moments that justify the existence of this film. In trying to think of what gave Condon and his actors the drive to continue working on this I can only imagine there was an ambition here that had to do with asking the audience the question of do we really want to know everything? 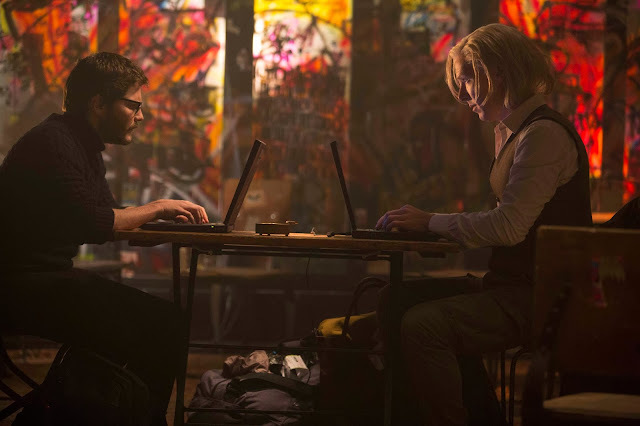 It's as if the thesis statement for the film should have been to explore not just the actions of Julian Assange and WikiLeaks, but what his actions mean in the grand scheme of the human psyche and the way the world operates. There are likely countless numbers of threats, close calls, unnecessary violence, and other horrible things going on in the world that the mainstream media will never address either because the story will remain contained or someone doesn't want us knowing about it. Some things are in fact kept from the public because it isn't necessary we know. It's likely best explained by saying that if we knew everything our governments know we would live in a constant state of fear. To a degree, ignorance is bliss and as it is the governments job to protect and keep a nation running there are simply some things we don't need to know in order to go about our daily lives without knowing how close we might be to death every day. Sure, many will say it is our right to know, but what would you do if you did have the information? Waste a good portion of your life worrying or building shelters and stocking up on food and water? It is understandable why everyone doesn't need to know everything, but as I watched the film unfold and Assange tell different stories to different people about how he came to have his white hair I could only wonder if all he really wanted to do was watch the world burn.